Growing up, one of my sister’s favorite cookies was called an oatmeal scotchie. It started with a traditional cookie dough with some rolled oats but then you swirled in some butterscotch chips (scotchies!) baked them until crispy. I liked them well enough and I ate them, (I mean c’mon now, they are cookies) but I’ve always preferred my cookies on the softer side. Don’t you? While wandering the grocery store aisles for my regular shopping I passed by these butterscotch chips and I began to feel nostalgic for the days of oatmeal scotchies baked by my mom. 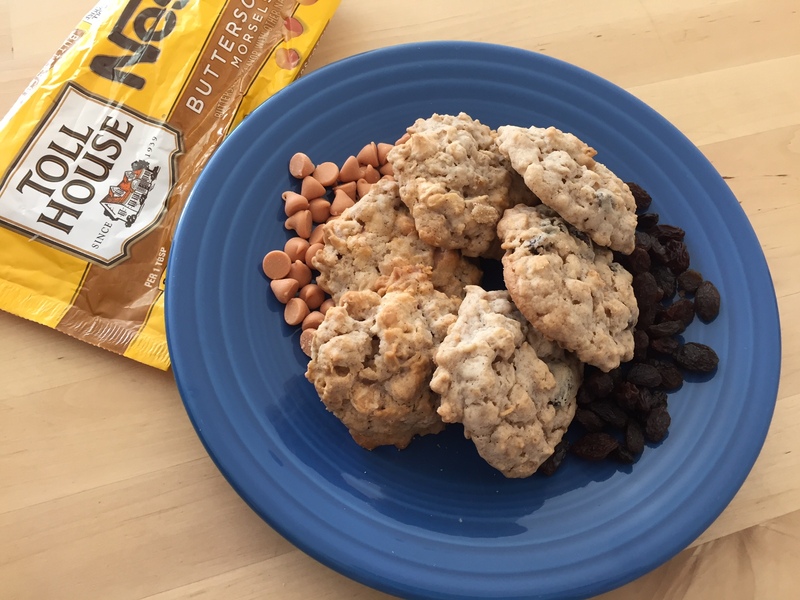 It seemed like as good an excuse as any so I threw them in my cart along with the other regular cookie ingredients (stocking up my Seattle kitchen!). When I got home I wanted to get to work right away. 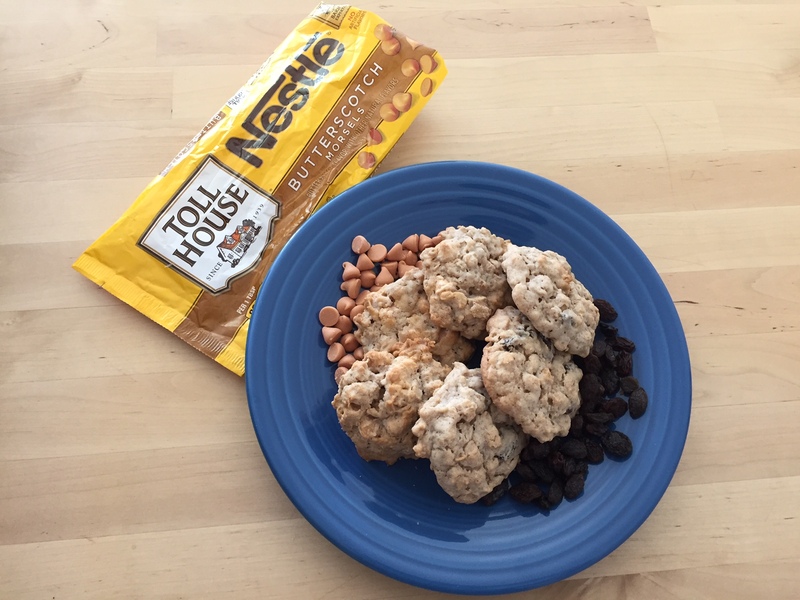 No time to waste for cookie making! I decided to start with the recipe on the back of the bag with some alterations (when do I ever follow a recipe exactly these days?). I tasted a few chips before starting and was surprised by how sweet they were (things are never too sweet when you’re a kid). So I decided to tone down the sugar a bit. I threw in some toasted pecans to help counterbalance the sweetness. 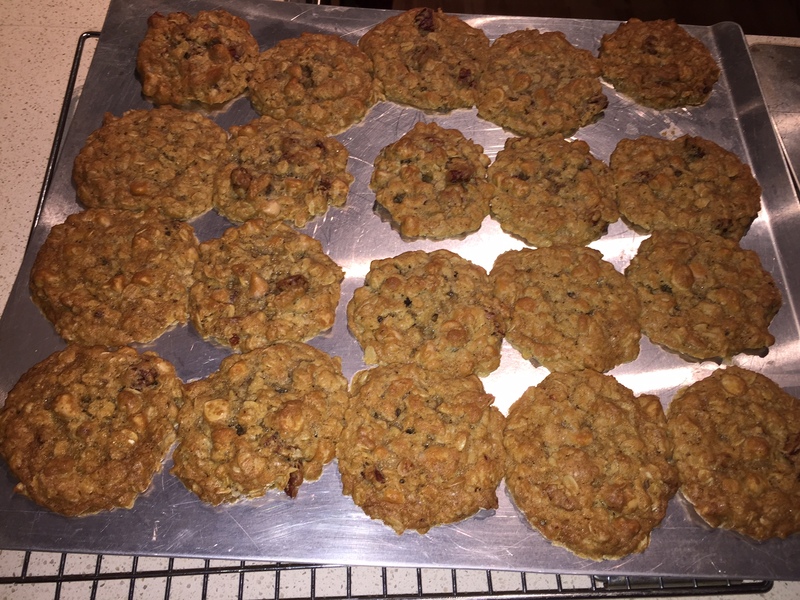 And just for fun I made half the batch with dried cranberries instead of butterscotch chips to see how that would go. Dried cranberries are part of the fall flavor collection it seems. 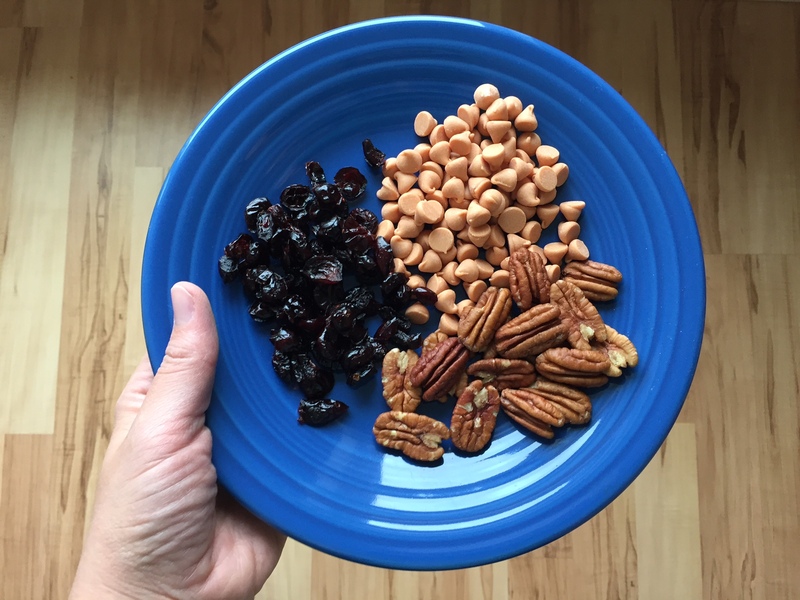 The first batch – too crunchy! Nonetheless I was disappointed with these cookies. (I mean, again, I ate them because they’re cookies for goodness sake, but I wanted them to be better.) These were too crispy and flat and the pecans hardly made a difference. So I ditched the pecans and ditched the recipe on the bag and started over. I turned to my great grandma’s recipe box, a beautiful heirloom handed down to me from my grandmother. I pulled out her recipe for oatmeal drop cookies and I made it (followed it exactly!) 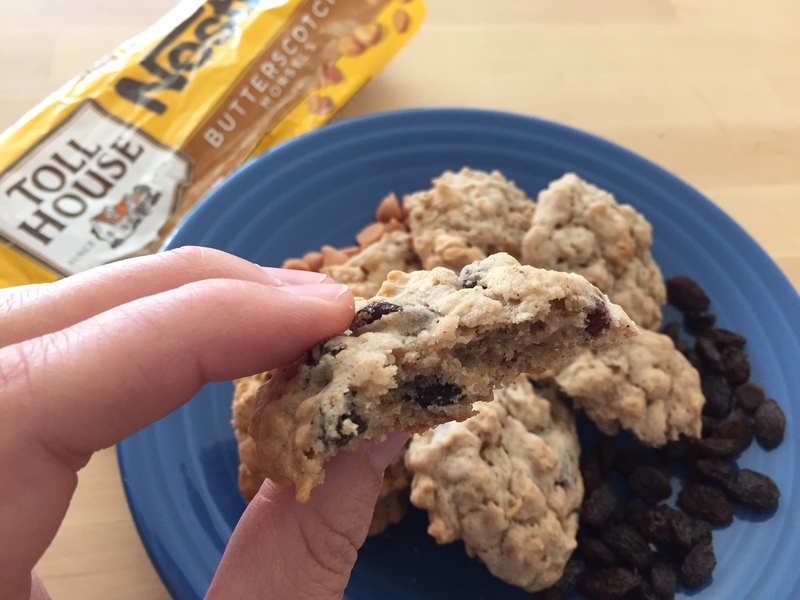 – half with raisins as the recipe states, half with butterscotch chips. They were soft and chewy and had just the right flavor of fall. Are you sick of pumpkin yet? Okay, maybe not, but give these a try if you want something different. Maybe I’ll spark a new fall flavor tradition! As a side note: these butterscotch chips are super sweet and a little fakey. My next project would be to figure out how to make better HOMEMADE butterscotch chips. Please leave a comment if you know any great butterscotch recipes! *You can try substituting butter for the shortening in this cookie, but you will sacrifice the texture! Using all shortening makes for softer cookies. I have not tried doing half butter and half shortening, but I imagine that would be pretty good. Start by creaming your shortening and sugar for a few minutes with an electric beater. Add the egg and vanilla and continue to beat until light and fluffy. Add milk and mix to incorporate. Don’t worry if it looks too curdled. Add in your flour, salt, baking powder, and spices and stir with a spatula to incorporate. Lastly add your oats and butterscotch chips and mix. My great grandma’s recipe says to bake these in a moderate oven, which I interpreted as 350 or 375. 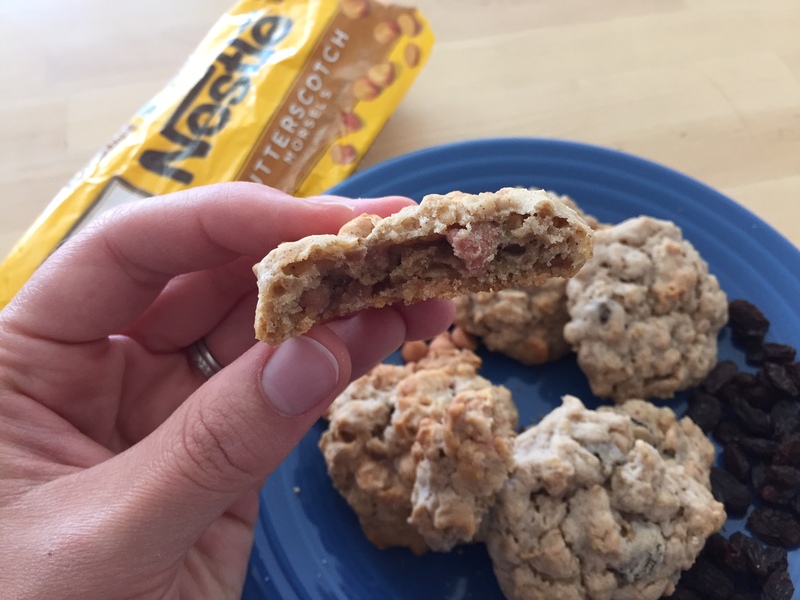 Scoop onto ungreased cookie sheets and bake for 12-15 minutes at 350. It should be a shorter baking time in a 375 degree oven and they may brown a little more. These came out a little pale in the end. Remove from pans and allow to cool. Enjoy warm with a glass of milk and a cozy blanket while you watch the fall foliage. Mmm fall! When you grow up knowing certain foods from a can or a box, it becomes hard to imagine how easy they might be to make homemade. I’m always surprised when I talk to people who say they made banana bread or blueberry muffins using a box mix, but maybe that’s because, to me, those foods are simple things that my family always made from scratch. Measuring the flour, baking powder, sugar and salt that it took for homemade muffins seemed just as easy as opening a box, (okay, opening a box is pretty easy) and in my mind it tasted much better. Of course my parents didn’t cook everything from scratch. We had our Sunday Kraft macaroni and cheese tradition, Cincinnati chili and tacos made from a packet mix, and chicken enchiladas with canned enchilada sauce. 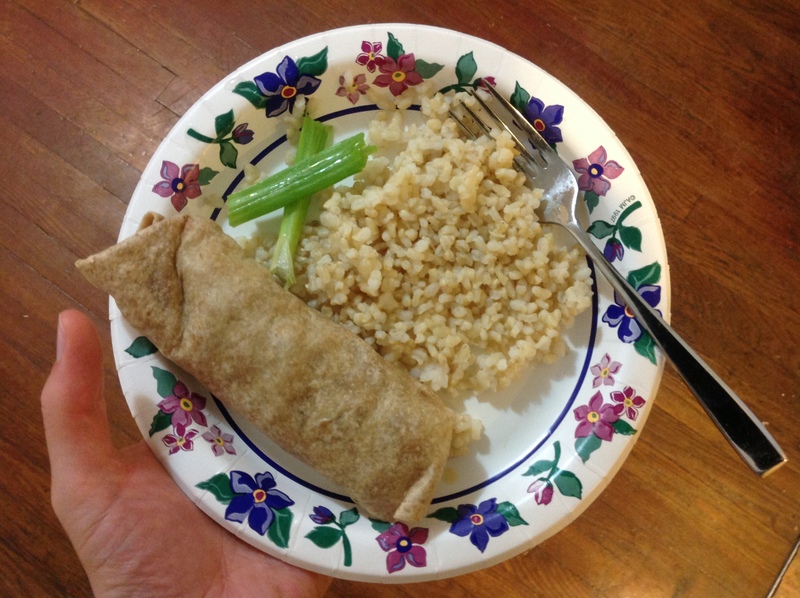 Having grown up with these foods, I never questioned their authenticity or feasibility as a homemade food. As my culinary skills and recipe collection broadened, I began to learn that many purchased foods I’d had growing up could easily be homemade. The start of enchilada sauce bubbling away: oil, flour, chili powder. 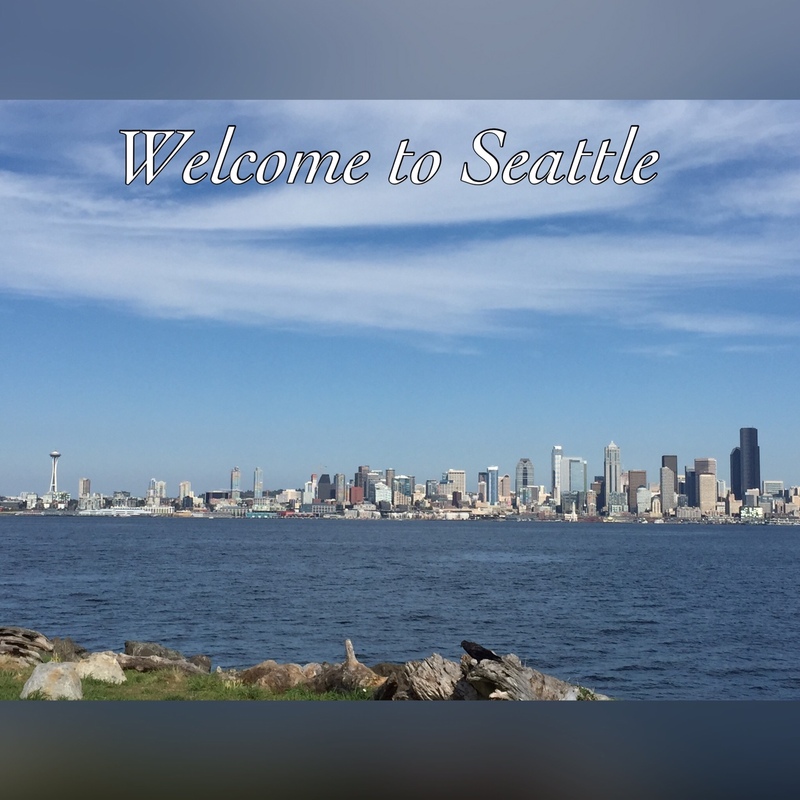 Before we packed up our whole life to move to Seattle, I made us a batch of freezer meals to get us through the days without our skillets, spatulas, pots, and plates. In addition to Meatballs and Baked Chicken Nuggets, I made a batch of Chicken and Bean Enchiladas with a homemade enchilada sauce. 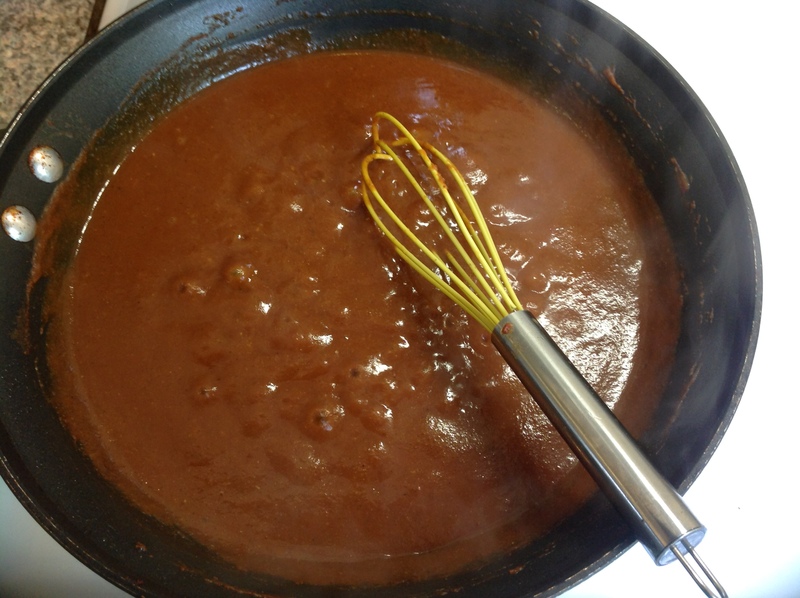 This sauce starts like many sauces with a roux, which simply means fat and flour. 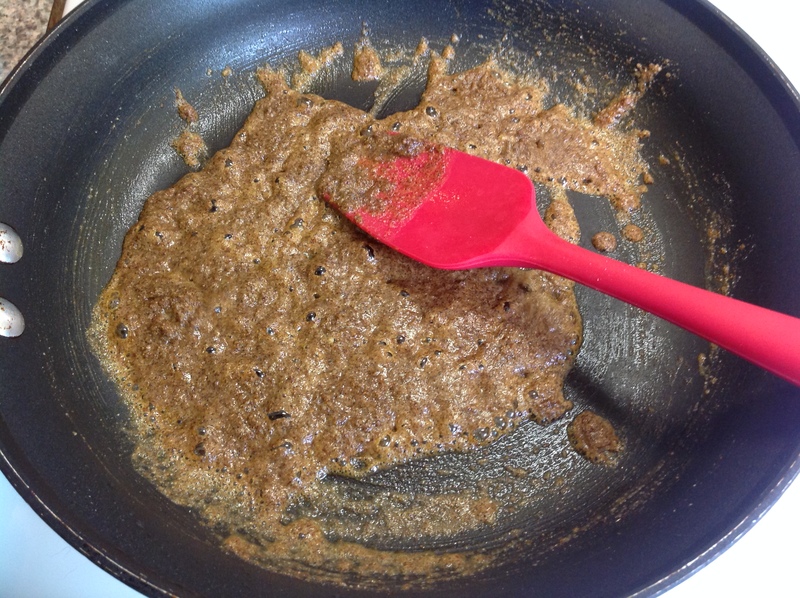 These two ingredients will be your sauce thickener and as long as they are whisked in gradually and lovingly you will end up with a rich and smooth sauce. Once you get the hang of it, it’s really quite easy. Not as easy as opening a can and pouring it in, but come on now – have a little fun! Bagged up, ready for the freezer! 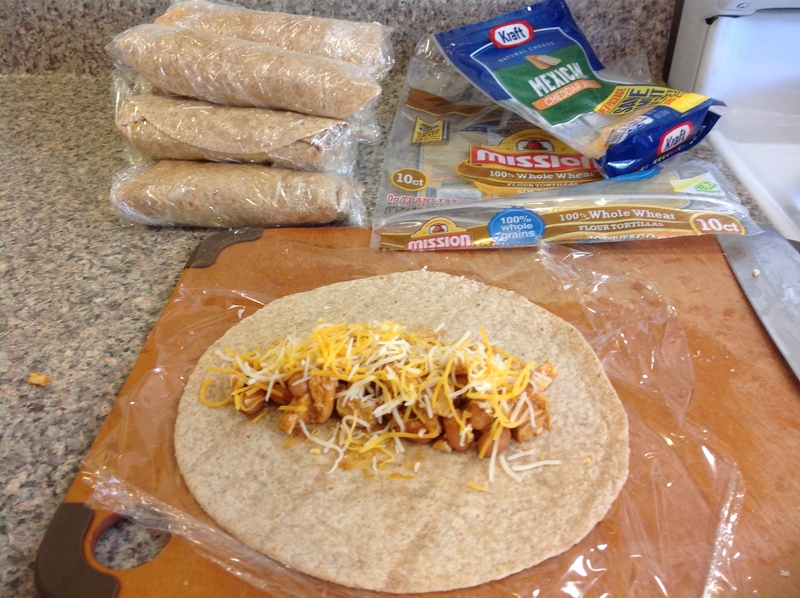 Fill up your tortillas with chicken, cheese, and beans and roll ’em up! Now listen: everyone has different culinary skills and ambitions. You might be just fine with your canned sauce or even your Mexican take-out place, and someone else might insist that everything be homemade with the purest ingredients. Sometimes you just don’t have time to whip up something from scratch and I totally understand. Nonetheless, I find it valuable to at least know, for all those canned and packaged foods you buy, how you could make it yourself. My rule is if you’ve made it at least once before or you know the process of making it, you are allowed to “cheat” every now and then and just buy the pre-made version. I know I’ve done it before. 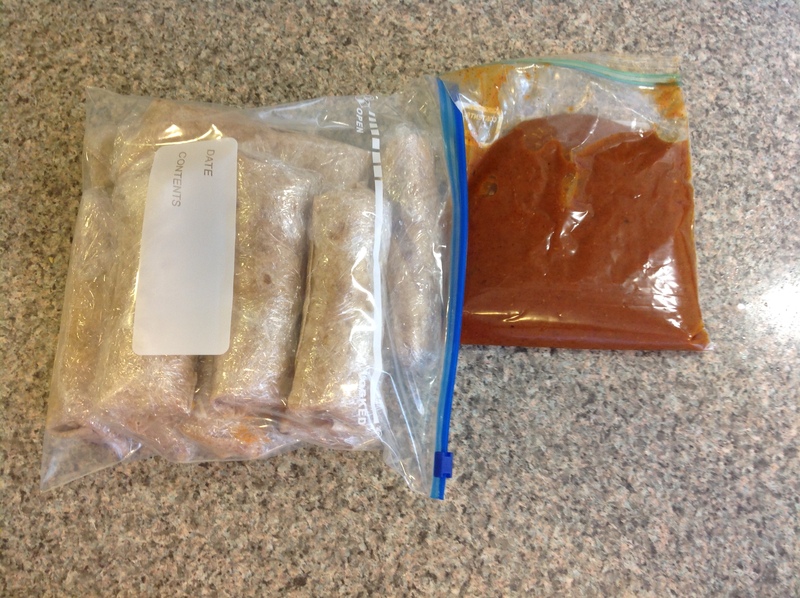 So go ahead now – try making your own enchilada sauce just this once and then you can go back to your canned stuff. Maybe you’ll like it. Maybe you won’t. *Whenever I make chicken enchiladas I start by simmering the chicken in chicken broth. For 3-4 chicken breasts I use 6-8 cups of water with Chicken Better than Bouillon added according to the directions. I bring that to a light boil and immediately reduce to a simmer to cook for 10-15 minutes or until all the breasts are cooked through. I remove the chicken breasts to cool and use the warmed broth to make my sauce. You can also buy canned broth or make your own using a fresh whole chicken with vegetables and seasonings. Make sure the broth is warm when you add it into your sauce as it will be easier to incorporate. 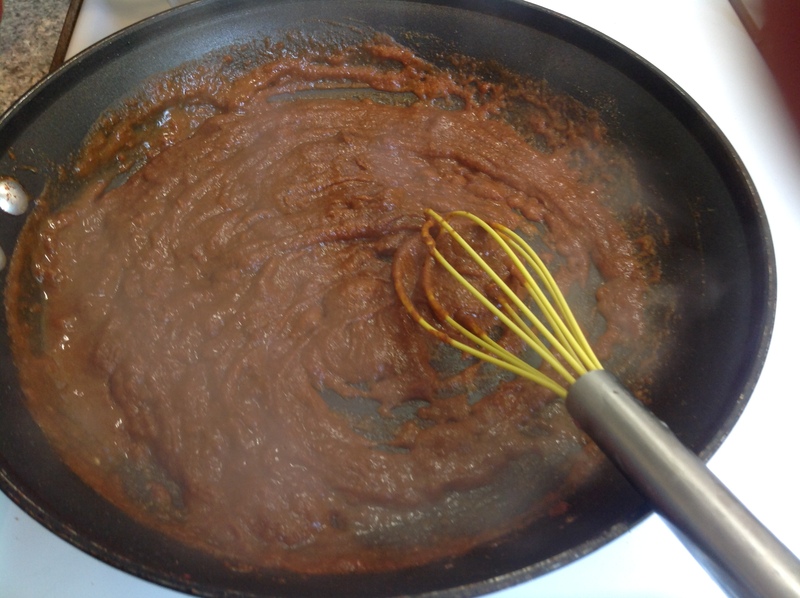 For the sauce: In a small bowl mix tomato paste, cumin, oregano, garlic, salt, and pepper. Stir to combine and set aside. Heat a large non-stick saute pan over medium heat. Add in oil, flour, and chili powder. Stir to combine until it becomes a thick paste. Add in tomato paste mixture and stir to combine. Slowly add in hot broth while whisking to dissolve the flour mixture. 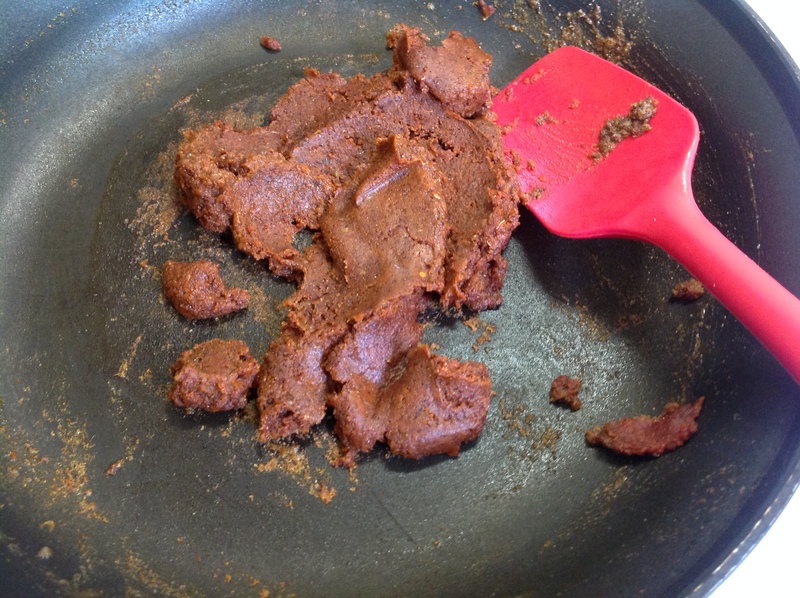 Make sure to use a non-scratching whisk if you are using a non-stick pan. Continuing whisking while adding broth to your desired thickness. You can always add more if it’s too thick when it finishes. Reduce heat to a simmer and cook for 5-10 minutes to deepen the flavor. Taste and adjust seasonings as needed – add more broth if it is too spicy or more salt and chili powder if it is too bland. Use to mix with your cooked chicken and to top your filled tortillas in the pan before baking. Have we talked about potatoes yet? Have we talked about how easy it is to give them crispy browned sides with very little work on your part? We haven’t?! I can’t believe it. 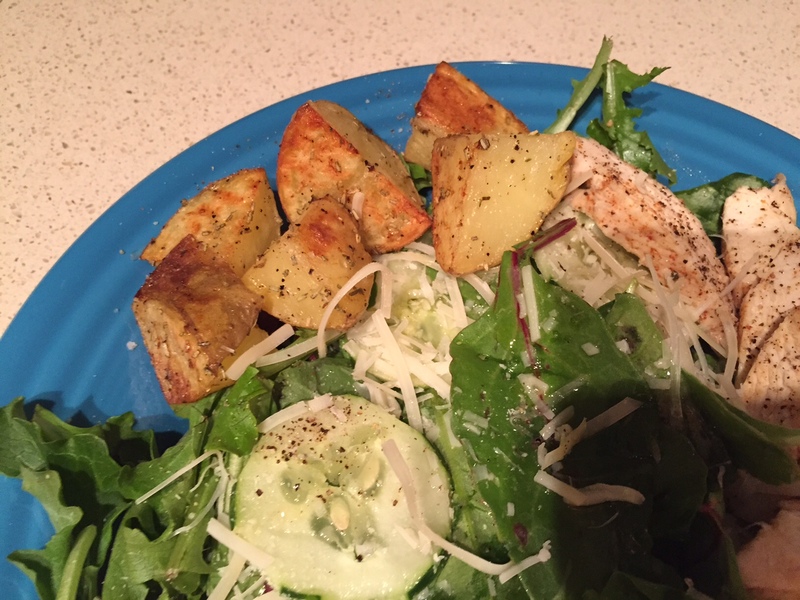 Crispy, roasted potatoes are a staple in my kitchen. They are an easy, affordable, adaptable, people-pleasing side dish that everyone should know how to make. If you don’t, no worries. That’s what I’m here for. First things first – potatoes. What kind? How big? How many? Personally, I am a fan of Yukon gold potatoes. They look buttery and golden, which tricks you into thinking they are covered in more butter or oil than they actually are (use them for mashed potatoes and everyone will ask you, because they are so yellow, how much butter you put in the potatoes to make them so goooood). You can also use red potatoes, purple potatoes, or even Idaho potatoes, but my personal favorite are the Yukon golds. As for size, it doesn’t really matter how big the actual potatoes are, though it may help you in deciding how many to cook. It matters more how big you cut them for roasting. As for how many to buy, I would cook 1-2 medium sized potatoes per person depending on how hungry your people are. When in doubt, make more. They aren’t as good leftover (no crispiness!) but it’s better to be safe than sorry. Size becomes more important when you cut them into pieces. You want your potatoes all to cook at the same rate, which means cutting them all relatively the same size. Don’t worry about perfection. If there are some smaller ones, they will just get extra crispy! Potatoes by themselves are pretty boring, let’s be honest. With the help of a little salt, pepper, maybe some garlic powder, rosemary, Mrs. Dash, or whatever strikes your fancy, potatoes become delicious little bites of starchy carbs! 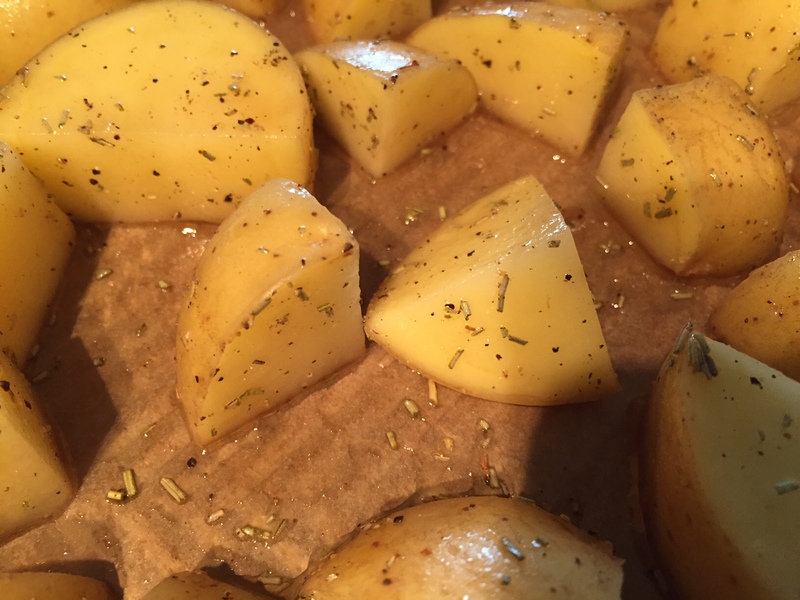 Start with your choice of oil – olive oil or vegetable oil – and drizzle evenly over your potatoes. I never measure*** so I don’t want to throw out some number and be totally wrong, but remember less is more. You want your potatoes to be lightly coated after they are all tossed together, not swimming in a puddle of oil. You can always drizzle in more if they look too dry. Next sprinkle in your salt, pepper, and other seasonings. Again, I don’t measure so I can’t help you there, but start by lightly sprinkling the top surface of your bowl of cut potatoes as if you were salting your scrambled eggs. You can always salt them after they’re cooked if they aren’t salty enough, though cooking them with salt will go a lot farther. As Sam always says, you can always add more salt, but you can’t take it away. Let’s talk about potato layout… has anyone every talked about that before? One of the keys to crispy potatoes is space! You want the potatoes to be friends, but they also need their bubble of personal space. If the other potatoes are all snuggled up next to them, things will just get steamy, no seriously! If you want soft, mushy potatoes, let them steam. If you want crispy potatoes, give them some room. Check out the photo above for a good example of the closest the potatoes should be. In fact, some of them are probably even too close. 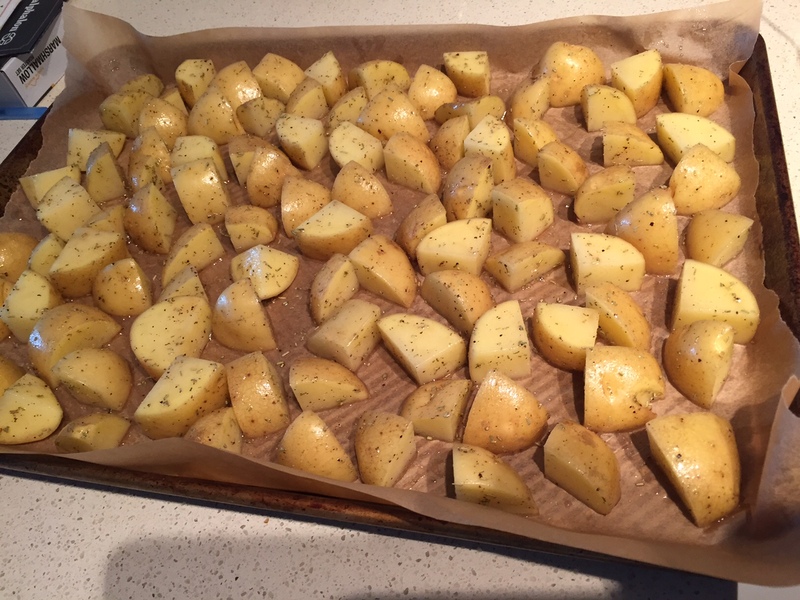 If you are cooking fewer potatoes you can obviously spread them out more, but you don’t want them any closer! Pick your pan according to the number of potatoes you’re cooking. Use two pans if you have to. Give them space and they’ll be happy. Also speaking of potato layout, do you see the two potatoes in the center of the photo above? The one on the left sits on a flat, cut side for better roasting! The one on the right sits on the skin side – less crispy! You want all of your potatoes to be oriented cut side down and not skin side down for ultimate crispiness. Skins can get crispy, but the starchy potato inside gets crispier. You may have to go through and manually flip all your potatoes once you spread them out, but it’s worth it. Lastly, high heat and an optional flip. 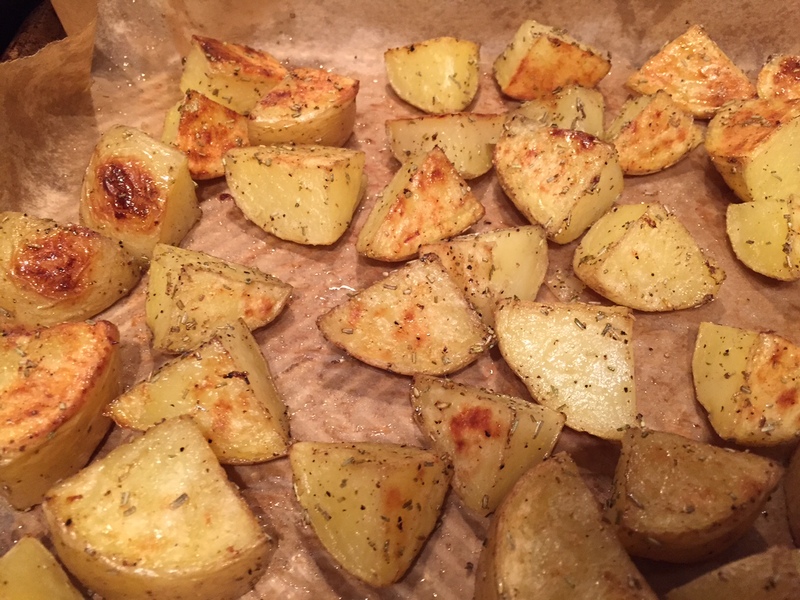 Potatoes roast best when they get a good amount of heat – 425-450 depending on your oven. Make sure the oven preheats all the way before you pop those babies in. If you want them to be crispy on all sides, it will take a little patience and a little extra effort. The laziest way is to do nothing, a step up is to stir and flip the potatoes with a spatula without worrying about if each one is being flipped (what I did for the photo below), and the ultimate effort is to remove the pan and flip each potato onto another side, one by one. You choose how crispy you want them. Give your potatoes time. They will need to cook all the way through first before they can begin to crisp up. Expect 30-50 minutes depending on the size you cut your potato pieces. 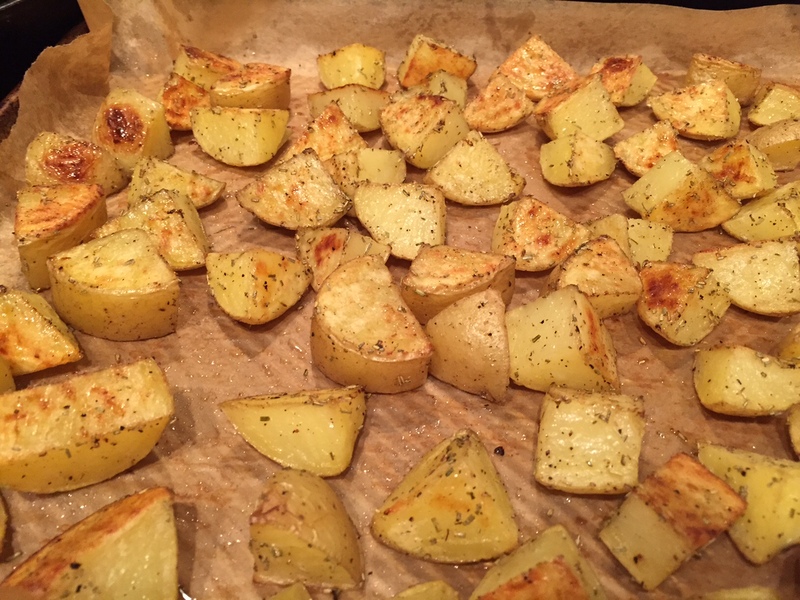 There you have it – crispy potatoes! I hope it worked. ***UPDATE: I made potatoes again last night and actually measured this time for everyone’s benefit! For 2.5 pounds of potatoes I used 2 T. oil and 1/2 tsp of salt. The other seasonings are up to you taste buds!